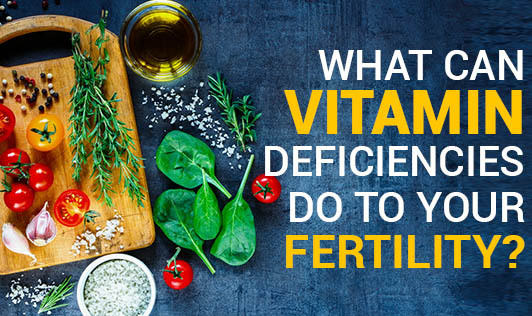 What Can Vitamin Deficiencies Do To Your Fertility? Your doctor may recommend that you add certain vitamins to your diet to boost your chances of becoming pregnant. The simple changes you can make at home are through a healthy diet and by adding a multivitamin supplement to your daily diet routine. Vitamins for Embryo Development - Folic acid is the most important vitamin for early development of the neural tube. By taking folic acid prior to getting pregnant and during pregnancy, women can decrease the risk of having a baby with a neural defect because folic acid is required for proper spinal cord and brain development. Vitamins for Healthy Reproduction - Supplements for fertility are an important aspect of the pre-conception period. Specific vitamins and minerals like Vitamin A, B, calcium, zinc, chromium, magnesium, iron, etc increase ovarian and uterine health. Vitamin C for ovulation - The Mayo Clinic states that although vitamin C may improve fertility in women with ovulation disorders, more research is needed to further define these findings. Vitamin C can be found in a variety of vegetables and fruits like cabbage, broccoli, oranges, lemon, amla etc. Vitamin D and the fertility factor - There is no conclusive evidence that a vitamin D deficiency results in infertility for either of the sexes. In "The Journal of Nutrition," clinical tests revealed that vitamin D deficiencies reduced rat fertility by 35 percent, although the deficiency did not diminish it altogether. Vitamin D will not cause infertility. Instead, it affects several bodily systems. It causes secondary complications like calcium deficiencies and an excess of phosphates, it can have an effect on the reproductive system too. Though these changes can be harmful, they don't completely disable them. It is common for mothers to give birth to vitamin D-deficient children while having the same deficiency. However, there is no single miracle vitamin to restore fertility. The vitamins needed by the mother and the baby before and at the time of conception include thiamin, riboflavin, niacin, pantothenic acid, folate and vitamins A, B6, B12, C, D, E and K vitamins to prevent deficiency. As a general rule, Gynecologists and Health experts' advice to go for a healthy diet rich in fruits and vegetables. It is also vital to follow a healthy life style, learn to decrease stress and make sure you have adequate amount of sleep every night.